Not only are 1 out of 4 seniors experiencing a fall each year, but new data shows that more seniors are dying from falls than were a decade ago. While you can absolutely take steps to help prevent falls like decluttering pathways in your house, installing grab bars and safety rails around the bathroom and stairs, utilizing mobility tools and orthopedic aids, and exercising regularly to maintain balance and coordination, it is also critical that seniors and their caregivers know what to do in the event of a fall. 1. Check for injuries – when you fall, you may know right away if you have hurt yourself. Pain, discomfort, swelling, blood, and bruising will signal that there is an injury. Sometimes, however, you may not see or feel any of these symptoms immediately because your adrenaline is rushing or you are confused or disoriented. It is key that you take a few minutes to calm your breathing and get back in touch with your body. Slowly move your feet, legs, arms, and hands. Do not attempt getting back up if you are dizzy. 2. Roll onto your side – this will allow you to rest briefly and double check you are not injured. 3. Pull yourself up onto your knees and hands – from this position you can crawl to a nearby piece of sturdy furniture or stairs on which you can pull yourself up. 4. Support your weight with your hands – place one hand at a time on a flat surface of the piece of furniture and lift your strongest leg up so your knee is bent and your foot is pressed to the floor. 5. Slowly rise to your feet – using your arms and legs, push up slowly bringing both your feet under you to stand up. Find something to sit on nearby, i.e. a chair, to rest and catch your breath. 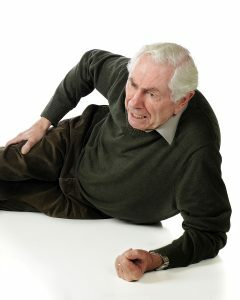 If you are unable to get up after a fall, call for help right away. If no one is with you but you are able to safely use your mobile phone, call 911 for help. Any potential injury to your neck, spine, or internal organs does require immediate attention so it is absolutely ok to call emergency services for help. 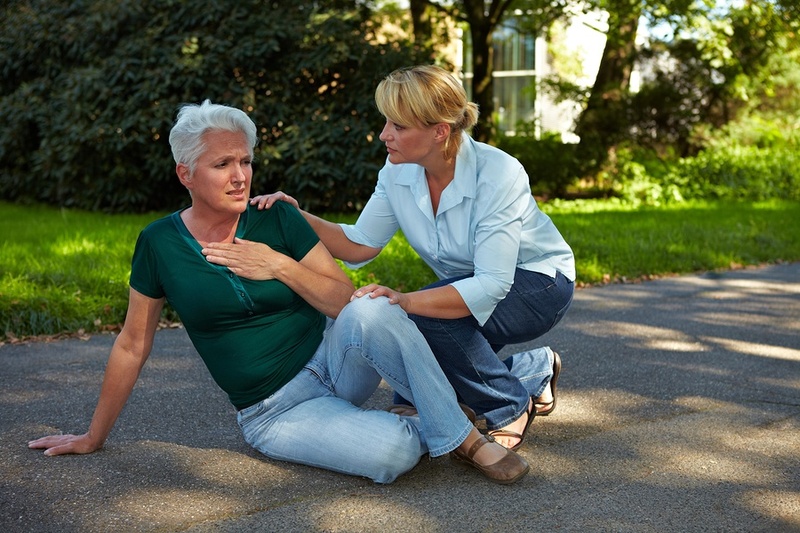 If you fall and are both by yourself and without a phone or medical alert device, on the other hand, keep calling out for help as your energy allows, banging on a nearby wall if reachable, and keep your body moving, even if only slightly, to stay warm.